Batting Cages-6 indoor hitting tunnels. Pitching machines are available for baseball and softball as well as batting tees. HitTrax Batting Simulator for personal and team development or entertainment. Leagues & Tournaments, Camps & Clinics. 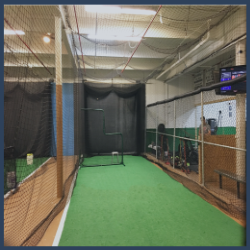 Whether you are looking to rent a cage just to take some swings, hosting a team batting practice or looking for instruction, player development or getting ready for your next season, or a full development program, we have what you need.